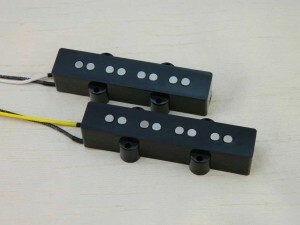 The Ironstone Jazz Bass pickups use Alnico V magnet pole pieces, giving warm, dark velvety vintage tones. The Jazz Bass sound clips below give a representative sample of the tones available from this style. Great for playing that aims to capture those vintage classic Blues and Classic Rock styles. Ironstone are happy to include good quality customer's Jazz Bass sound clips - please just get in touch through the Contact Us page. Thanks to Neill Dodd for this array of sound clips. There are 2 sets, on the left with the guitar on its own, and with a low level drum track on the right . Each of the 2 sets covers all 3 basic pickup configurations, including the tone control fully on and off in each case. The guitar is a Jazz Bass style with round-wound strings. Recording was by Direct Injection into Cubase through a Yamaha mixer. Thanks to Mark Shepherd for his selection of Jazz Bass clips. They were conditioned through a Zoom B2.1u multi-effects pedal and recorded with a Yamaha Pocketrak hand-held recorder. EQ was set in the middle for all frequencies, and both guitar volumes and tone set to maximum. Particularly check out the excellent 'One of these days' track 2 cover! Thanks to Kazuki Takahashi (over in Canada) for a very fluid bass cover of Charlie Puth's "We Don't Talk Anymore". And what a cool guitar!